Alex Irvine Wins on Jeopardy! The Alex twins, Trebek and Irvine. 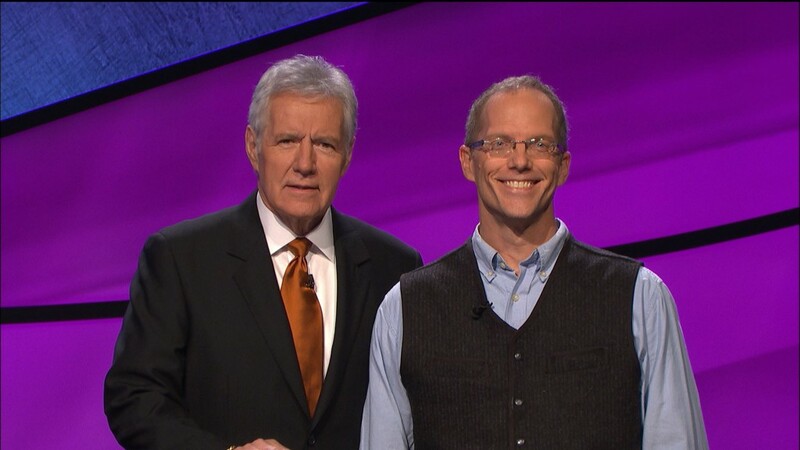 By Tom Galloway: SF/fantasy/comics writer Alex Irvine won Wednesday’s episode of Jeopardy! with a whopping $26,000, and will defend his championship today. While he obviously did well, he made a horrible Daily Double wager. He got the final Daily Double as the last clue in the game, meaning the scores after his answer would be what they’d be in Final Jeopardy!. Irvine had $20,000, and the player in second place had $12,800. To my shock, he wagered $5000, which makes no sense. If he wagered $5600 and got it correct, he’d have a lock tie game with exactly twice the score of second place. If he wagered $5700, and got it correct, he’d have a lock win with more than twice second place’s score. For either of those, if he missed, he’d still be in the lead. $5000 just keeps him in the lead, whether or not he gets it correct or not, and doesn’t provide any sort of lock if he does get it correct. As it happened, he missed the Daily Double, and then was the only player to correctly answer Final Jeopardy!, so it didn’t matter. I wondered if that was the SF writer. Suzle and I watched him win, but we missed the show on the following night – Presumably he lost, as he was not in sight two nights after his win.